But now that I have bigger hair and less time on my hands, sitting down once every month -for 6hours or more - is becoming inconvenient. Yesterday, I woke up with dull looking hair and was in no mood for head wraps or mini twists. Buns were also out of the question but I knew that I had to do something with the mane. So I sat in front of the mirror, moved my hair from side to side and came up with what you see below. I did one didi plait (french braid) at the back and tucked the end into the braid. 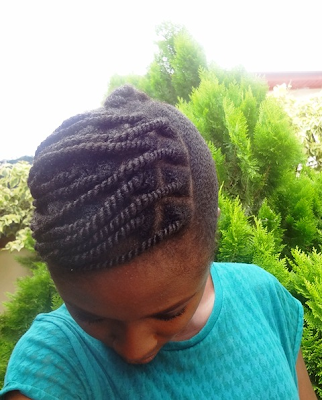 I then made little box sections, smoothed the roots with a gel made by Natural Nigerian and then twisted. 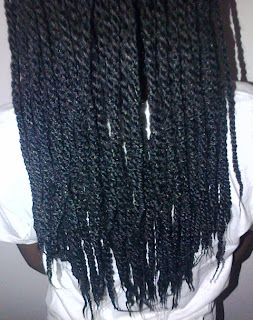 After I was done with that, I used the same gel and a brush to smooth down my hair, pinned down the twists and tied a satin scarf. Some minutes later, I took it off and out I went. How much time did it take me to style my hair? 40mins! Win! What you see in the picture above is my hair after running around under the sun in very humid weather (Abeg where that sun wey commot for Abuja come from yesterday? Chei! )My hair still looks neat and I plan on carrying it for 3 more days. Here is another simple style I did for my little sister some time ago. If I can't think of something new, I'll be wearing this next week. Anyone care to share some simple styles with us? Send pictures to eskinks@gmail.com or give me a description in the comment box below. It'll be fun trying to re-create what I can't see. Beautiful easy styles to do! 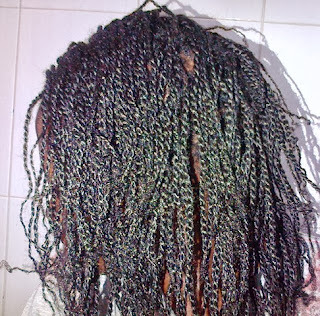 Unfortunately my hair is under a crochet weave so can't try them out soon. Thank Hadassah! Sadly I'm not on instagram but thank you for sharing. Beautiful! You really have gorgeous hair. Love the style! It's pretty simple and very neat. Did you need to use a gel? When I try twisting my (Short) hair, it just isn't as neat. Not smooth even from the beginning so I wonder what the problem is. Maybe my technique? Does twisting damp or dry make a difference? Thank you AB. Yes, I used Natural Nigerian's light gel. 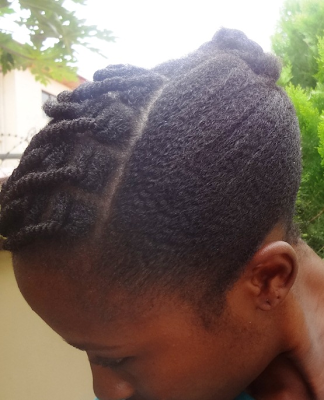 Hmm...have you tried smoothing your hair while twisting it? That makes all the difference. Twisting wet/dry hair while smoothing it leaves your hair looking neat. if you aren't very good at this, you can thread your dry hair a day before twisting. Threading stretches and smoothes the hair. Having 'neat' looking hair starts from washday. 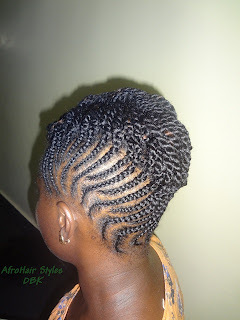 Smooth while applying your sealant and leave -in before braiding. 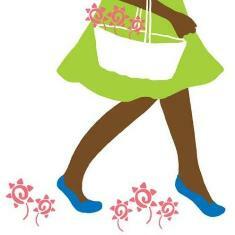 Hmm....styles for TWA's...can you send a mail to me at eskinks@gmail.com. I will like to see your hair length so we can talk more about styling. Thanks for sharing AB. you too are coming out of your "lagbaja" mode? Beautiful style! I remember the alst two styles. u said when you first went newly natural or you mean when you started blogging about it? cus your length doesnt look like someone who just went natural. as for simple hairstyles, I've got a bunch of them under "Mane Styles" on my blog (themanecaptain.blogspot.ca). 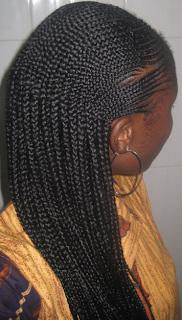 btw, do you braid tight? your sis scalp looks very pulled/bumpy. Lol at lagbaja mode. Thanks for the compliments. No, I meant what I said. I just don't have that many styles showing my short natural hair. When I went natural I thought that protective styles had to be small-small dee-dee or braids, but now i know differently.As long as my ends are tucked in, I'm good to go. I will look up your blog cause I need all the inspiration I can get. With time you will get there. Thank you Darkchildlovethyhair:) Like CuteStrand said, you will get there in time. Just try enjoying each phase of your journey because long hair comes with its responsibilities too. I love your hair Natmane, you inspire me.